There is something so moving about seeing a comicbook legend long-lost and lamented return at the very top of their game. That's what happened in the original SHAOLIN COWBOY book which no one seems overly keen on distributing now. Geof (one 'f') Darrow was the artist on Frank Miller's HARD BOILED, a series so ancient, pre-Page 45, that it was never reviewed. His clean line and detail rivals even that of the great George Pérez, but with far, far, far more gore and a much wider sense of space. I used one of the panels from HARD BOILED in the Page 45 15th Anniversary Booze Bash quiz, so high is my admiration for the man and so long has his art endured in my memory. This is the comicbook equivalent of one those enormously enjoyable and equally improbable kung-fu flicks starring the likes of Jackie Chan, and that ingenious acrobat is referenced here. I, however, would contend that any cinematic version of this virtually silent, stop-and-gawp slice-and-dice-athon is more likely to star the dour Beat Takeshi. It's that left-field. Forget the insane, two-page prose introduction (funny, though), and ignore the fact that a frog - being an amphibian and therefore inherently quite partial to water - is highly unlikely to be sitting on a menhir in the middle of an oh-so-arid desert! 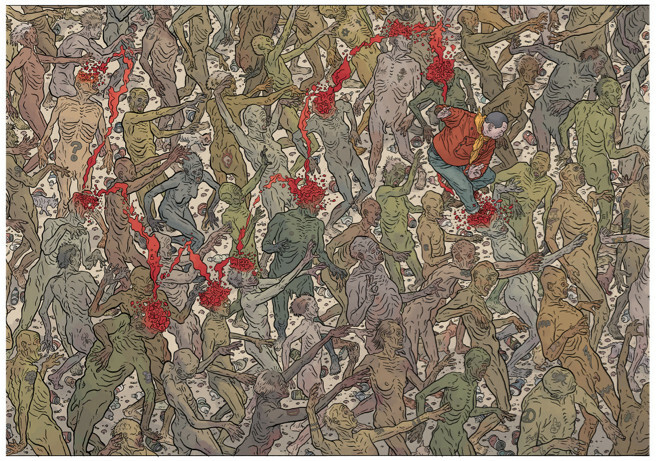 Relish instead the resurrection of the Shaolin Cowboy who has clawed his way back through the earth from Hell, bringing with him hundreds if not thousands of persistently single-minded zombies. What follows is some of the finest choreography ever in comics, and a concrete lesson warning you against using the word "gay" as a lazy pejorative. Seriously: don't do it. The Shaolin Cowboy will show you why. Can I just interrupt myself for a moment to mention Dave Stewart? Dave Stewart is the colour artist. When something's this detailed it takes a lot of keen thought and just-so judgement to create clearly defined clean space from clutter. Keeping the sky lambent is a great start both during shots looking up as our hero descends and also throughout the whole of Act 2 which is a) landscape b) viewed from just above knee-height, meaning there is sky to be seen between limbs for a colourist clever enough to pick it out properly. Foreground depths (plural) are equally important, answering the sky's blue hues with appropriate and increasingly dark shades of brown which is a tradition going back to Claude Lorrain if not further. It's a book in four acts with a certain degree of symmetry. Acts two and three are quite specific in their corpse-culling procedures but equally, hilariously relentless. The only equivalent I can think of is sonic: Wiseblood's 'Motorslug' extended remix. But those last six minutes repeat precisely the same bludgeoning refrain whereas here Geof nimbly and fluidly fashions variation after variation of meat-cleaving mutilation in what I can only describe as the ultimate chainsaw massacre before the juice runs dry and our Cowboy quick-foots it across his quarry instead, deftly dispatching the beetle-bearing shamblers on the stepping-stone hoof. You'll see what I mean. The fourth and final act is a rip-roaring, wear-tearing, jaw-flooring finale before "Praise be to Buddha" and BLAM! You won't see that coming. But Darrow throughout is having a laugh and the last laugh follows "The End". You just know to whom it will belong.